Ferritin is often called the “storage” location for iron in the body. 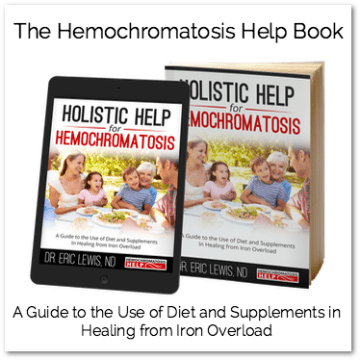 In someone without hemochromatosis, it is the second most common place where iron is found in the body (second only to hemoglobin) and provides a necessary role for providing a “savings account” for iron for times of famine or low-iron, such as in anemia. When a person has become overloaded with iron, the majority of the excess iron joins in this convenient storage form of ferritin. Like renting a storage unit for excess furniture and possessions, the ferritin tries to put the excess iron out of sight, and out of mind. But then the first storage unit fills up, so you have to rent another one, and so on and so forth until you have a really big problem. Our body’s storage units are our liver, spleen, and bone marrow, with the highest levels in the liver. Therefore, in hemochromatosis, the liver is the internal organ most at risk of damage from the accumulation of iron. Once inside the cells and organs, the iron may start to cause health complications associated with oxidation, inflammation, and cellular stress or damage. If these levels get excessively high, permanent damage may occur. You have probably heard of ferritin before; it’s a common blood test that your doctor has likely run and that you may have been told is elevated. High ferritin, in fact, may have been the initial marker to make your doctor suspect hemochromatosis in the first place. Ultimately, your ferritin level is a way to monitor your iron overload status over time. At this point, I want to make a distinction between the binding protein called ferritin and the blood test measuring ferritin. Ferritin, in and of itself, is a good thing that our bodies have created to solve a problem. It serves the valuable functions of keeping us safe by binding potentially damaging excess iron as well as storing iron for the future needs of the body. 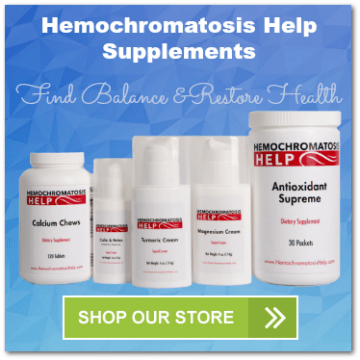 So then, why is too much ferritin on a blood test “bad” in hemochromatosis? After all, if the symptoms and complications of hemochromatosis are due to excessively high levels of iron, and the protein ferritin keeps iron bound and inactive, what’s the problem? While ferritin itself is not bad, the presence of excessively or abnormally high levels of ferritin on a blood test indicates that the body as a whole is suffering from iron overload. Similar to how a life vest can keep an individual afloat in the water, the iron-binding protein ferritin serves to store iron in a safe and sound manner. However, when hundreds and thousands of life vests become necessary to use (like, say, on the Titanic) this signifies that a very serious situation has developed. At a certain point, there become too many individuals requiring life preservers without enough lifeboats. So what happens when there’s too much iron? In hemochromatosis, the increased level of iron causes the body to make more ferritin to bind more and more iron over time. The ferritin is just trying to do its job, but before you know it, there’s way too much iron and way too much ferritin. As a result, tracking the amount of ferritin by using a blood test is the best way to estimate the total amount of iron stored in the body, and is therefore a very important lab value your doctor may use to monitor your hemochromatosis. Most doctors and experts agree the ferritin level (the blood test) is the measurement most closely associated with long-term, chronic damage to the cells and organs seen in hemochromatosis. The blood test ferritin can signal the need for more help before the ship starts to sink. One last note: Even though ferritin level most commonly reflects the burden of iron on the body, there are several other reasons why a person could have high ferritin– most notably in certain cases of inflammation or infection.